Use the Edit Team screen to add teams or edit existing teams. Notes on some of the fields and actions are listed below and annotated on the screenshot. Title. The title does NOT appear anywhere on the front end (via the shortcodes), but it is used on the back end, in particular, it is used to sort the (All) Teams screen. Team Name & Team Mascot. These fields DO appear in the front end displays. Which one, or both, depends on the display settings for the sport. Team Short Name. The short name should be an abbreviation of FOUR or fewer characters. It will be used on the scoreboards in a upcoming release. Home Venue. The team’s home venue (field, arena, stadium) may be selected from the Venues database. It is not required, but if it is not specified, the venue/location field must be set for each of the team’s home games. Team Logos. The logos may be uploaded to and selected from the WordPress site’s Media Library. In that case, the text will be entered automatically when the image is selected from the library. 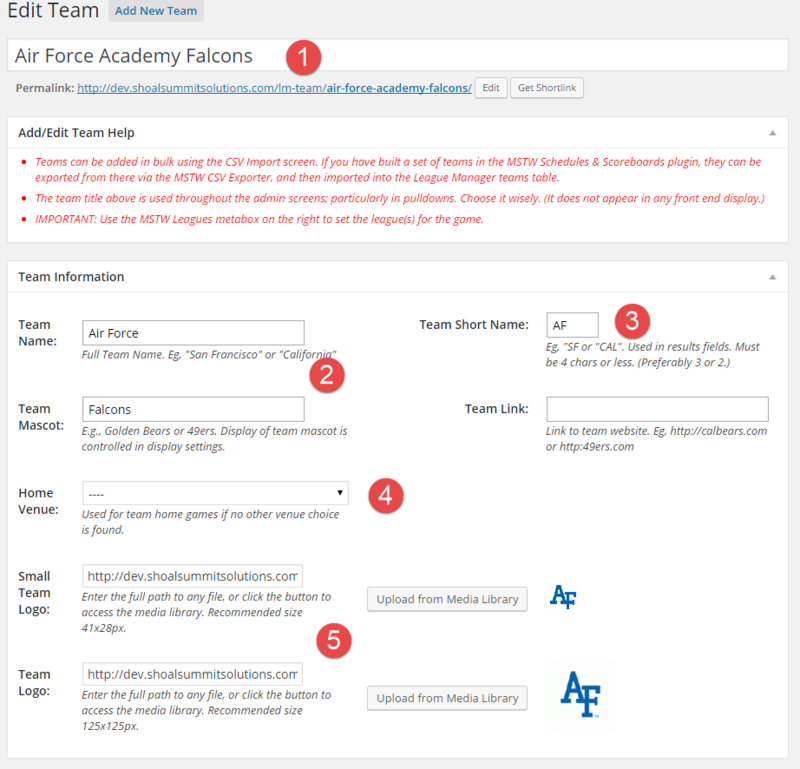 If you choose to load the team logos somewhere other than your site’s Media Library, a URL may be entered in the text fields. SMALL Logos are used in tables and should be 41×28 pixels. The TEAM logos are used on the Games pages and should be 125×125 pixels.